At the beginning of the 18th century arranged marriages were the norm, but by the end of it they fell out of favour with nearly everyone, the upper class excepted. Family’s interest stood in opposition to Christian morality. Marriage should be for love, because it’s instituted by God, and not by any civil contract. Anglican marriage is a lesser sacrament, and its only condition is the mutual vow of love. One can lie and sign any papers, but one cannot possibly cheat God or hope that God would bless what is an abuse of the sacrament He instituted. In fact the romantic notion of love and marriage revived because people became more concerned with religion than they were in the 17th century. Yet, it doesn’t mean that they ceased to care about the prudential aspect of it. Parents took care that their daughters met only those gentlemen they could marry without degradation. In other words they were free to fall in love with the men they knew, but the group of the men they were allowed to meet was limited in advance. My English Country Garden Blog is a wonderful place to sneak into the English countryside. Here I’ll be sharing my thoughts of other gardens, old recipes and garden writers with you, from William Lawson via Jane Austen and Charlotte Bronte to Nancy Mitford. Landscape gardens were one of the major features of Jane Austen’s England. It was more than a nice place to stroll. It was a philosophy of the 18th century life. Austen chose Easter for the most significant turn in Pride and Prejudice. Darcy comes to Rosings around Palm Sunday (likely Monday, since Darcy, unlike Mr. Elliot, wouldn’t travel on Sunday), that commemorates the triumphant entry of Jesus into Jerusalem in the days before his Passion. When talking of love it is important to define the word. Is it emotion, feeling, decision or all of the elements? According to some Christians i.e. Anglicans and Catholics four kinds of love must be present for the Holy Matrimony to be valid and complete. I’ll try to explain, on their example, Elizabeth’s growing love for Darcy in Pride and Prejudice. There is a lot of confusion as to when and why Elizabeth Bennet fell in love. (See this post at Austenprose and subsequent comments for example, but it’s only one of many such opinions.) This post is to show that the reason of it does not come from any imperfection of Lizzy’s affection or Austen’s writing, but rather our modern notions that downplay the significance of love. While it’s not news that blue coat was fashionable among young men of Austen’s era, not everyone might be aware that it was due to Goethe’s influence. It cost me much to part with the blue coat which I wore the first time I danced with Charlotte. But I could not possibly wear it any longer. But I have ordered a new one, precisely similar, even to the collar and sleeves, as well as a new waistcoat and pantaloons. But it does not produce the same effect upon me. I know not how it is, but I hope in time I shall like it better. Werther in his blue coat and yellow waistcoat. I uploaded Daniel Defoe’s short essay on The Education of Women. The more of his works I read the more I wonder whether Austen in particular was influenced by Defoe, or just everyone was, and so the ideas present in his writings were generally embraced by the time Austen was born. In this Defoe argues in defence of female education, bringing arguments, including a great deal of reading, that make one think of Elizabeth Bennet. 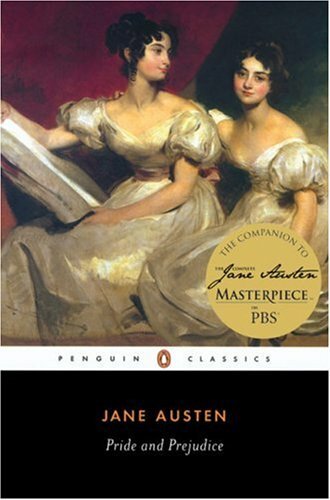 Read my review of Pengiun Classics edition of Pride and Prejudice.